A perfectly looping image sequence player with full screen capabilities, built with mobile performance and keyboard accessibility in mind. Using this component you will be able to play back a series of images like a video. Notice: This project's primary objective is playing back animations at the highest possible visual quality, likely in fullscreen mode. Providing frames with a resolution of 1920x1080 and no visible compression artifacts is strongly recommended. To date, the player has only been designed for, and tested with animations of a 16x9 aspect ratio. 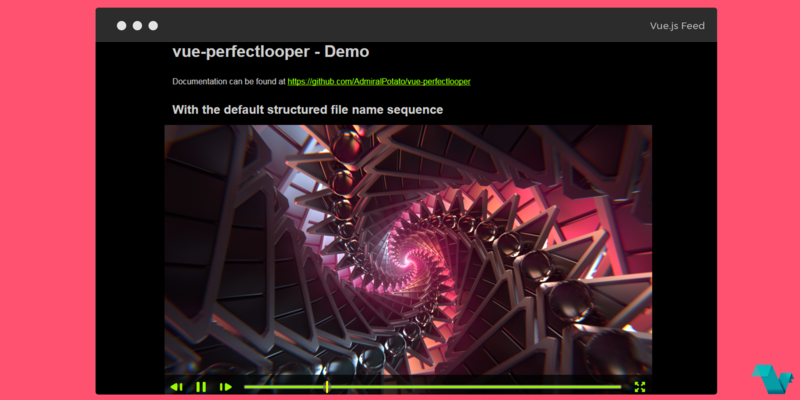 To start working with vue-perfectlooper use the following command to install it. The following example is going to be with non-sequential image addresses. Using an array of image adresses, we are specifying each frame of the play back. In this example, there are no expectations of asset organization, as each frame path is completely specified explicitly; As a side effect of this, the number of frames does not need to be specified in this configuration. To learn more about providing frames to the player, click here. If you would like to explore more about vue-perfectlooper , head to the project's repository on GitHub, where you will also find the source code.